I am a big broccoli fan myself. In high school my mom would have raw broccoli and dip sitting out for my sister and I to go to town on as our after school snack. So when I saw this recipe from Ina Garten, I knew I had to try it. What I didn't expect, though was that it would be such a hit even with the kids. 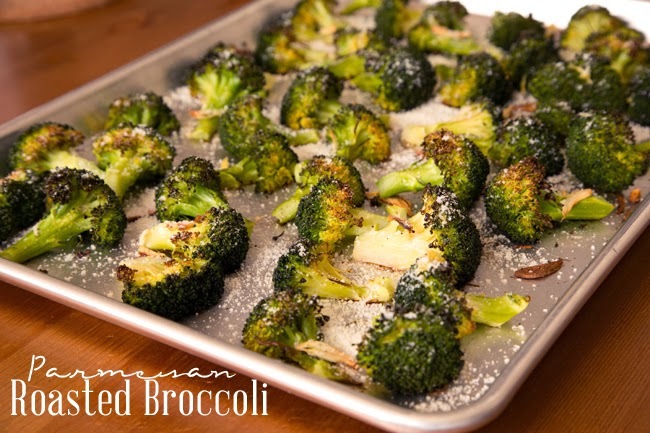 We had a friends over last week and I served this roasted broccoli - I couldn't believe it when all 5 of the kids ate it up with no complaints (and some asked for seconds)! Cut the broccoli florets from the thick stalks. Cut the larger pieces through the head with a small knife, pulling the florets apart. Place the florets in a single layer on a cookie sheet (I covered mine with aluminum foil for ease in clean up). Toss the garlic on the broccoli and drizzle with 5 tablespoons of olive oil. Sprinkle with the salt and pepper. Roast for 20 to 25 minutes, until crisp tender and the tips of some of the florets are browned. Remove the broccoli from the oven and immediately toss with 1 1/2 tablespoons olive oil, lemon zest, lemon juice, pine nuts and parmesan. Serve hot. **Ina's recipe also calls for adding 12 leaves of freshly julienned basil leaves, which you add at the end, but it didn't fit with the rest of what I was serving so I left it out. I think it was plenty flavorful without the herb.